PHILADELPHIA (AP) LeBron James showed the up-and-coming Philadelphia 76ers just how high the bar is to compete with the Eastern Conference’s best. 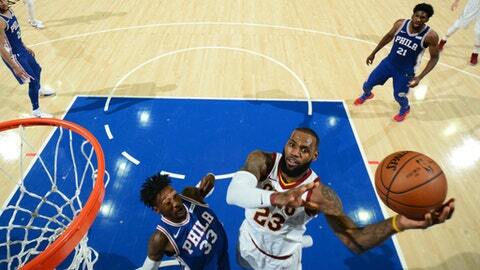 James had 30 points, 13 rebounds and six assists to lead the Cleveland Cavaliers over the 76ers 113-91 on Monday night. The three-time defending conference champions won their eighth straight game. Dwyane Wade scored 15 points, and Jeff Green had 14 points and 10 rebounds. He scored the first nine points on his way to 22 in the first half, helping Cleveland to a 53-45 lead by draining a 3 in front of Cleveland’s bench at the first-half buzzer. Lue tried to downplay any significance of Cleveland beating a team on the rise. Joel Embiid had 30 points and 11 rebounds to pace the 76ers, who had won three straight and five of six. The four-time MVP James had four points, including an emphatic dunk, and J.R. Smith hit three 3-pointers early in the third as the Cavaliers took a 14-point lead. Philadelphia got within five in the period, but the Cavaliers stretched the advantage to 86-73 entering the fourth. Kyle Korver’s 3-pointer with 9:13 to play gave Cleveland a 94-77 lead. Philadelphia’s Ben Simmons entered leading all rookies in scoring (18.5 points), rebounding (9.1) and assists (7.7), but he was hounded all game by Jae Crowder and managed just 10 points before exiting in the fourth quarter with a right ankle sprain. Simmons, who has turned to James for career and life advice, missed all of last season with a broken right foot. Brown provided no update on Simmons’ health, and Simmons wasn’t available to the media. Crowder tried a different approach in guarding Simmons, crowding him on the perimeter and not giving him room. The 76ers were 3 for 28 from 3-point range, including 0 for 11 in the opening half. Cavaliers: Iman Shumpert returned after missing the last three games due to left knee soreness. Shumpert was scoreless in seven minutes. 76ers: Eagles players LeGarrette Blount, Malcolm Jenkins and Brandon Graham were seated courtside, and several other players watched from a box. Cavaliers: Host the Heat on Tuesday night. 76ers: Close out a six-game homestand against Washington on Wednesday night.